Follett Corporation has unveiled an innovative new apparel customisation programme at its University of California Berkeley store. Marketed under its Fall Rush private label brand launched earlier this year, the Shirt Bar allows in-store customisation of UC Berkeley and Cal Athletics officially licensed apparel with over 20,000 possible design combinations. At the Fall Rush Shirt Bar located within the newly updated Cal Berkeley store, consumers can customize Fall Rush apparel with every Cal Athletics team, club sport, University degree program, and a range of current and vintage school marks. 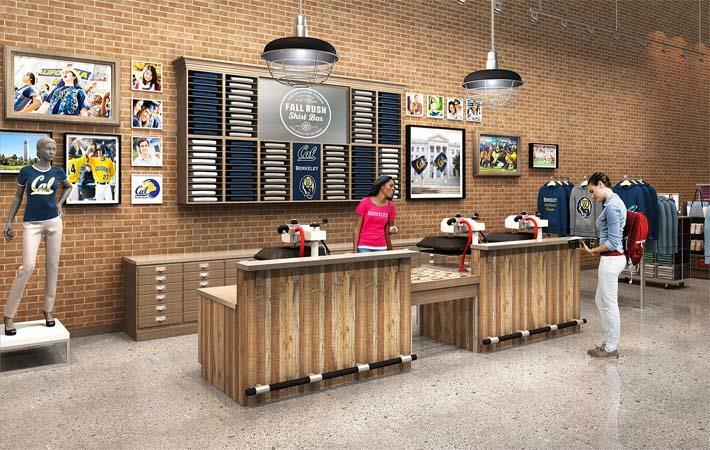 Resembling a trendy coffee bar, the Fall Rush Shirt bar is the centerpiece of the newly updated Cal Berkeley store where consumers can take selected Fall Rush apparel items to the bar and customise them with every Cal Athletics team, club sport, University degree programme, and a range of current and vintage school marks. Available exclusively at the Follett-operated store at 2470 Bancroft Way in Berkeley starting with “The Big Game” between Cal and Stanford on November 17, Fall Rush Shirt Bar products will initially consist of tee shirts and sweatshirts decorated with traditional collegiate applique graphics including tackle-twill, felt and chainstitch embroidery.